In the last days of World War II, as the American military fights the Japanese to regain possession of the Philippine Islands, a group of villagers hiding in a cellar pass the time by telling folktales and stories of their own lives. Think of it as "Like Water for Chocolate" meets "Battle Cry"--a collision of dreamy culinary magic realism and gritty military real-world realism in which neither of the two genres come off particularly well. Reading this novel reminded me of why I decided to keep my reading list mostly restricted to writers who grew up in the lands I had chosen, and why I was leery of adding any hyphenated Americans at all. 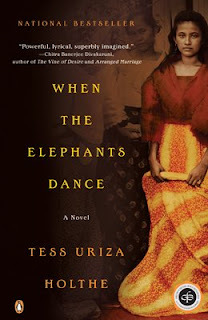 I am even thinking of discarding my Korean--American choice--a writer far more accomplished than Tess Uriza Holthe--so deeply was I disappointed in "When the Elephants Dance." That's unfair, I know--it is possible to write authentically about a country and a culture that you know only second hand, but Ms Holthe seemed to think that a riveting anecdote from her father ( who suffered first hand from the Japanese invasion), a smattering of folk stories, and in in-depth knowledge of lumpia and other staples of Filipino cuisine are sufficient to pull off a complicated plot. Sadly, she just didn't have the ability to make me care about any of her characters, or to believe in the authenticity of her world. I didn't read any interviews with the author, as I've learned that it tends to color my interpretation of the book, but I wasn't surprised when I found out that Ms. Holthe had started the book as a writing group exercise of Filipino folk tales, and that the war material was interwoven later. It accounts for the strange, cobbled-together feeling of the book. It's all very well to insert stories into a main story "The Decameron" style, but it has to be handled with finesse or all plot momentum is lost. I could very well understand that people huddled in a cellar (though a cellar in the tropics? really?) would need to do something to pass the time, but launching into a tender love story right after surviving a strafing in the streets of Manila seemed to me to be an inopportune moment. And any forward motion of the plot, or of the wartime atmosphere of an occupied land was destroyed. Repeatedly. To be fair, some of the stories were rather charming, even if all of the narrations sounded the same, whether related by a peasant fisherman or a haughty, middle-class woman. The story of the boy caught up in the clutches of a Filipino fish-god was particularly good. Ironically, these vignettes were better than the any depiction of the real events that were occurring, though they did, as I've said, yank me out of present day World War II. With the exception of the opening scene, in which the boys searching for food while the adults stayed hidden in the cellar (also something I believe unrealistic) are tortured by the Japanese, the violence in the book felt false, a worn been-to-the-movies feeling of fakery. I felt as if I were viewing the scenes of brutality through a thick smeared glass, or maybe through a telescope. I felt nothing at all, and felt rather guilty that I felt nothing at all, not even when one of the three narrators, a teenage girl, is captured by Japanese soldiers (after a not-to-be-believed incident of bravura stupidity) or at the climactic shoot-out with the heroic resistance fighter. It's strange to say, but the most authentic part of the book were the descriptions of the food, even if the loving relating of the appearance of these recipes to other people (who would have known how to cook these dishes ) also seemed to be a bit unrealistic. "When the Elephants Dance" has gotten many good reviews. With such a clunky plot, wooden dialogue, and a theatrical backdrop thinness, I really don't know why. Maybe it's because it's such an EARNEST book. I could see people at the local book group, who don't normally read war novels. talk about how brutal war is, and how much they learned about the "exotic" culture of the Philippines. It's a well-meaning book, and I'm sure that Ms Holtze's admirable goal was to pay homage to her parents' culture and experiences during the occupation. That doesn't keep it it from having a thoroughly made-up dishonest feel to the whole business.